On June 9th of 1865 Charles Dickens had a brush with death. While he survived, others weren’t as lucky. 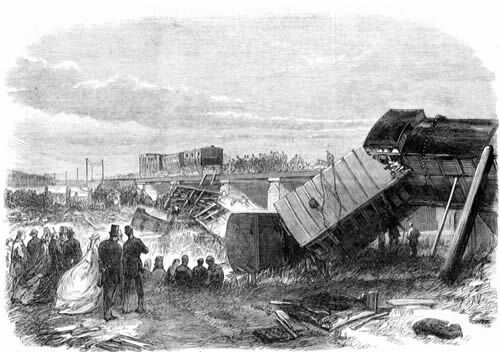 Ten people died and forty were injured in the Staplehurst railway accident. The day began innocently enough. Dickens was returning from a trip to Paris. In the coach with him were Ellen Ternan and her mother. The train track was being repaired near Staplehurst. Workmen did not signal to oncoming trains that there was a gap, 42 feet long, in the tracks over a bridge. The train’s engineer spotted the problem at the last minute, but it was too late. Momentum carried the engine and the first part of the train across the breach. However the coaches in the center and the rear of the train fell into the river bed below. All but one of the first-class coaches went into the ravine. That was the coach that carried Dickens, Ellen Ternan and Mrs. Ternan. While their carriage did not fall into gap, it was hanging off the bridge at a steep angle. Dickens and Mrs. Ternan were uninjured. Ellen had only minor injuries. Others weren’t as lucky. Ten people were killed and about fifty were injured. 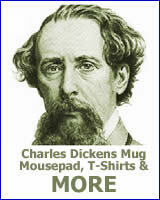 Once Dickens helped the Ternans from the coach he went about the work of assisting his fellow passengers. He retrieved a flask of brandy from the train as well as his top hat. He filled the hat with water and then did what he could to aid and comfort the injured. Later he said that the scene was unimaginable. One poor man was visible to the rescuers, but there was no way to help him escape. The man later died, still pinned under the train. At one point Dickens gave an injured lady who was resting under a tree a sip of brandy. The next time he passed her she was dead. 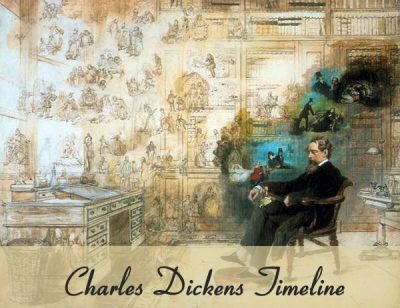 For three long hours Dickens did what he could to lessen people’s pain and suffering. When help finally arrived and the accident scene was being evacuated Dickens remembered something. There was still something in his train compartment that he needed. He made his way back into the wrecked train one last time to retrieve the latest installment of Our Mutual Friend, the novel he was writing at the time. For years afterward Dickens would sometimes suffer from sudden feelings of anxiety when he was traveling by rail. On Friday the Ninth of June in the present year, Mr. and Mrs. Boffin (in their manuscript dress of receiving Mr. and Mrs. Lammle at breakfast) were on the South Eastern Railway with me, in a terribly destructive accident. When I had done what I could to help others, I climbed back into my carriage–nearly turned over a viaduct, and caught aslant upon the turn–to extricate the worthy couple. They were much soiled, but otherwise unhurt. The same happy result attended Miss Bella Wilfer on her wedding day, and Mr. Riderhood inspecting Bradley Headstone’s red neckerchief as he lay asleep. I remember with devout thankfulness that I can never be much nearer parting company with my readers for ever, than I was then, until there shall be written against my life, the two words with which I have this day closed this book:–THE END.